You can look a little bit foxy by dressing up like the Tenth Doctor from the popular BBC series, Doctor Who! 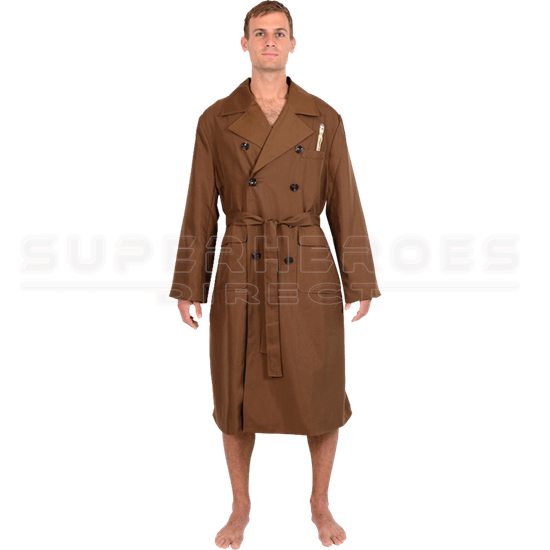 The Doctor Who Tenth Doctor Trench Coat Robe mimics the apparel worn by David Tennant during his tenure as the Doctor. The brown robe features lapels and buttons in a double-breasted trench coat design. A pair of pockets appear in the front for added usefulness, and an embroidered sonic screwdriver peeks from a faux chest pocket. A belt allows you to cinch the Doctor Who robe at the waist. Fans of the reboot series are sure to enjoy the style of this Tenth Doctor bathrobe! I would like to say that this was the easiest i have ever had customer service. The operator was very kind and courteous, as well as accurate and direct in the estimated time. Thank you for making this process so easy.